Last week I started an ASTAR course where we will be working with “ARCHETYPES” and the roles we play in our lives. According to Carl Jung, founder of analytical psychology, Archetypes are ancient, universal patterns of behaviour that are embedded in the "collective unconscious." It is believed that every person has been encoded with a set of 12 primary archetypes. Four of these are universal archetypes related to survival: the Child, Victim, Prostitute, and Saboteur. These four Archetypes are said to be vital to our growth and functioning as adults. The other eight are drawn from the vast storehouse of archetypes dating back to the dawn of human history. They play valuable roles that relate to our work, relationships with individuals and society, as well as to our spirituality, finances, values, and our highest potential. Author Caroline Myss has created a unique set of Archetype Cards which we used in this process art class. Each card is designed to provide the basic Light and Shadow attributes of the different Archetypes. We started by each choosing a card from the deck. 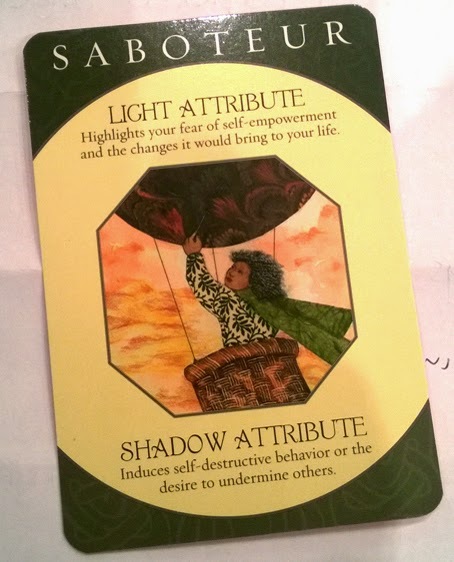 The card I pulled, the Saboteur, read, "Highlights your fear of self-empowerment and the changes it would bring to your life" and "Induces self-destructive behaviour". I could totally relate to both. We worked in clay in this first session. We held the ball of clay in our hands and did a lovely, relaxing, guided meditation which always helps you to get into the session and to leave your busy day behind you. We then had about 2 hours to created our sculpture. 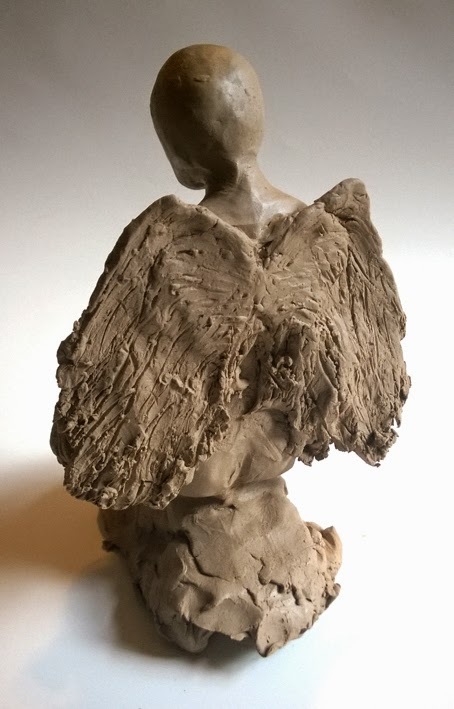 Working freely without any preconceived ideas or plans, my sculpture started off as one thing and then change direction and end up as something else. 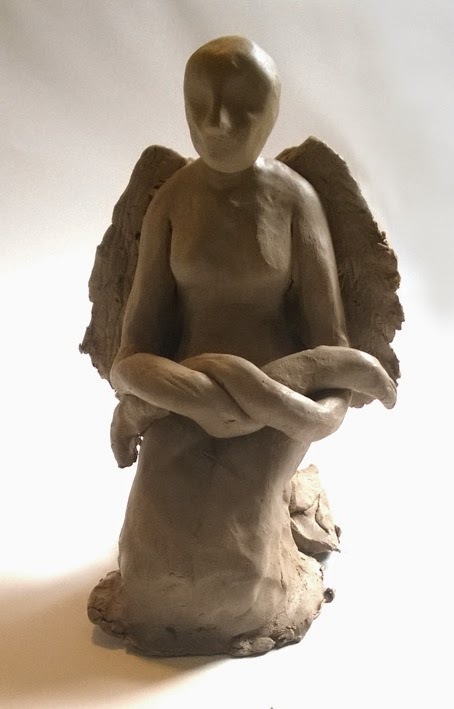 My tall, confident, standing figure ended up as a kneeling angel, with exaggeratedly long arms which were folded in her lap. At the end of the session we took time to reflect on each person's work, leaving them a short message on a piece of paper. 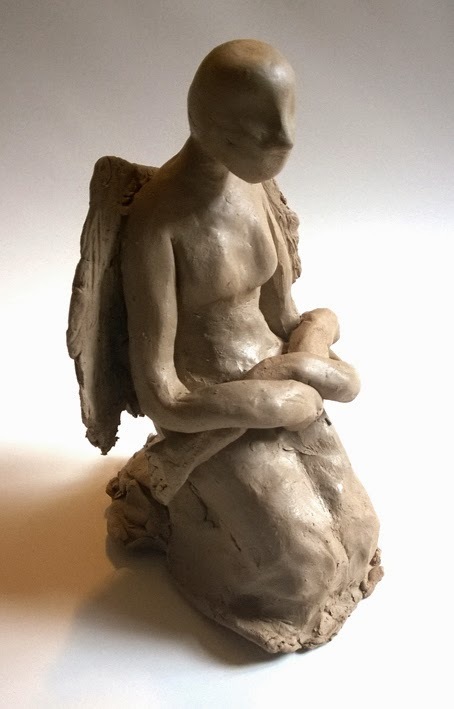 When reflecting on my own work I wrote, "I have been given the wings of an angel but I am refusing to fly." 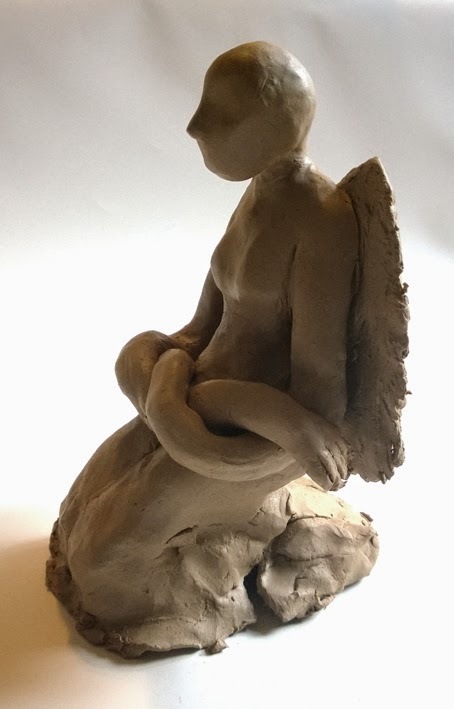 I called this work "Refusing to Fly"
This may be the most difficult of all the archetypes to understand, because its name is associated with betrayal. Yet the purpose of this archetype is not to sabotage you, but to help you learn the many ways in which you undermine yourself. How often do you set new plans in motion, only to end up standing in your own way because of the fears that undermine those optimistic plans. Or you begin a new relationship and then destroy it because you begin to imagine a painful outcome. You begin a working relationship with another person and find yourself once again in a power struggle that could be settled peacefully -- but you fall into the same destructive pattern because you fear the other person. The Saboteur's fears and issues are all related to low self-esteem that causes you to make choices that block your own empowerment and success. As with the Victim and Prostitute, you need to face this powerful archetype that we all possess and make it an ally. When you do, you will find that it calls your attention to situations in which you are in danger of being sabotaged, or of sabotaging yourself. Once you are comfortable with the Saboteur, you learn to hear and heed these warnings, saving yourself untold grief from making the same mistakes over and over. Ignore it, and the shadow Saboteur will manifest in the form of self-destructive behaviour or the desire to undermine others. Am I able to recognise the Saboteur in others? Would I be able to offer others advice about how to challenge one's Saboteur? If so, what would it be? If you are interested in reading up further about Archetypes, I can recommend visiting the Caroline Myss website where she has a list of over 70 archetypes, including a detailed description of each. There is also a section that can help you to determine your own Archetypes.